Most consumers do not look at their energy use data from month to month, however most utilities provide some information on the monthly bills that consumers would find useful. It only takes a minute to review your usage to see if there is something unusual going on. The picture on the left shows the annual usage data for our own electrical energy usage for the past year. It shows the usage for the past six months and the same month from the previous year. The number of days for each measurement are shown along with the kilowatts used in that period. Our utility also offers time of use metering, with peak times, mid peak and off peak usage measurements. Our time of use metering stopped working for some reason in May. Although we have reported this to the utility, they have yet to send someone out to fix it. The rates for each period are quite different. Peak rates almost double of that for the off peak periods. The utility implemented this approach to encourage consumers to use energy during off peak periods in an effort to reduce their peak usage during times of high use. 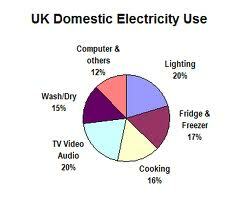 Reduce energy use by drying clothes, running the oven and turning up the air conditioning during the off peak periods. It should reduce the energy bill received each month. Run appliances during these off peak periods to conserve energy and save money. It has worked extremely well for many utilities and pushed high usage activity into lower usage hours. The data we have just reviewed is pretty typical of what is provided to consumers by some utilities. The companies that provide heating fuel also provide similar reports. Which can be used to help consumers monitor their energy use. If you take these steps to reduce your energy use, you should be able to see the difference quickly. Especially when you look at your energy use data provided by your utility. Some utilities will also provide daily use charts, to help you monitor usage on a daily and hourly basis. Most utilities will not provide a graph of your energy data. Compare year over year usage on a graph can be helpful to compare your savings and monitor time periods. Especially when you are using more energy such as during the summer time when the air conditioning is being used. We have focused on the energy use data for consumers, however business’s can demand much more information due to the higher level of usage and bills. In fact large companies will even schedule shifts to take advantage of lower rates during the day or weekends. Monitor the usage and their subsequent energy bills. Monitoring your energy use data is important to control expenses. It is information that allows you to see what level of energy is being used. This allows you to take steps to control how much is used. Take action now by examining your latest bill from your utility. my bill got screwed up and i still do not have an answer from the hydro company. i have spoken to two different people, one a supervisor, and they still have not got me an answer on my electricity usage data. what a bunch of poor managers.